We’d love your help. Let us know what’s wrong with this preview of Haven Lost by Josh de Lioncourt. To ask other readers questions about Haven Lost, please sign up. This book was incredible. I didn’t expect it to be half as good as it was, most fantasy books now run along a similar theme, but this has to be one of the best I’ve read in a long time. I loved the main character, Emily. She’s not overly dramatic or insecure like most heroines are. Yes, she experiences doubts from time to time, but mostly she approaches situations with a clear head and tries to sort things out the best she can. Whether that’s her miserable home life, finding her way in a world wh This book was incredible. I didn’t expect it to be half as good as it was, most fantasy books now run along a similar theme, but this has to be one of the best I’ve read in a long time. I loved the main character, Emily. She’s not overly dramatic or insecure like most heroines are. Yes, she experiences doubts from time to time, but mostly she approaches situations with a clear head and tries to sort things out the best she can. Whether that’s her miserable home life, finding her way in a world where she doesn’t belong or entering battle she is generally as focussed as she possibly can be. Every other character in this book had a purpose. I either found myself laughing or getting frustrated with their actions, willing them to help or just hoping they would go away to leave our protagonists to be successful. I particularly want to mention Celine, who made me laugh a great deal but is also a perfect example of the friend we all need. Every time I thought I had figured out where the book was going something happened and I was back at square one again. At no point though was I bored. There was always something happening, some situation to be figured out and added into the puzzle that was slowly taking form. I’m going to be honest and say I didn’t see what was revealed in the ending coming at all. It was as much of a surprise to me as it was to Emily. I’m very much looking forward to the second volume and I hope some of you will read it with me. If you are looking for a fresh, new fantasy series set in an epic world then I think you would enjoy this. Haven Lost is the first book in The Dragon's Brood Cycle, and we start off with sixteen-year-old Emily playing a game of ice hockey. Things don't go quite the way she expected, which shakes her belief in herself and her knowing. That night, Emily is taken from the world she knows, and wakes up to a whole new world. One where she has to learn the rules, and figure out just who she can trust. This was such a great story! All the characters are believable and have their own quirks and foibles, altho Haven Lost is the first book in The Dragon's Brood Cycle, and we start off with sixteen-year-old Emily playing a game of ice hockey. Things don't go quite the way she expected, which shakes her belief in herself and her knowing. That night, Emily is taken from the world she knows, and wakes up to a whole new world. One where she has to learn the rules, and figure out just who she can trust. This was such a great story! All the characters are believable and have their own quirks and foibles, although I will admit to Emily and Corbmacc being favourites of mine. This story has great world-building, with questions raised over just how 'good' each side is, and whether you can rely on someone else's words. This is the kind of book where you reach the end and immediately want to start the next one - which is what I will be doing very soon. Sixteen-year-old Emily Haven is the star of her hockey team at Lindsey High. She believes her success comes from an innate ability to see the future right before scoring a goal. Hockey is her first love and her escape from her chaotic, deteriorating life with her drug addicted mother and her mother’s live in, drunk of a boyfriend. The day she misses a shot that she knew without doubt she would make, is the day everything changes. She begins to see a dirty boy in torn clothing looking out of reflections at her. When disaster strikes, she runs towards her vision and away from her school, hockey team and life. Waking up in a new land, she finds herself torn between two factions in the middle of a rebellion she knows nothing about. I really liked the setting in this book. Emily is pulled into a different world and I love discovering the rules of a world different than our own. She quickly becomes a candidate to be a Sorceress’s apprentice and meets other girls with special abilities like her own. The magic in this world seems to be organically based. There were no fireballs in sight, but lots of growing vines like in Sleeping Beauty. 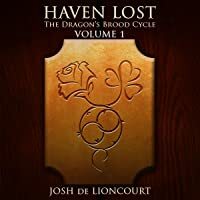 Josh De Lioncourt includes a unique race, a humanoid lizard man, who is starting a family with a human woman. This was a great dynamic because they dealt with prejudice and misconceptions from the world around them. It gave me great hope for the future books. I would love to see more of this race of people. The whole story moves fast and builds on itself well. I spent the whole book wondering what would happen to Emily next. That being said, I found the ending a little disappointing. Josh De Lioncourt does a wonderful job world building. He made me interested and curious about the unique world and history. The entire book made me want more. Then at the end, I felt like the twist didn’t live up to the story he had written. A good twist makes me look back over what I’ve read and suddenly all the broken pieces fit together into a solid picture. That ‘AHA’ moment where I realize, if I were a smarter reader, I might have known. This book I felt that the twist didn’t fit with the story. Instead of ‘AHA!’, my reaction was more like ‘….what the…?’ Instead of ending up satisfied, I was more confused. I definitely felt like I missed something and I still don’t know what. However, all that being said, I still think you should give this book a read. I’m looking forward to the next book that comes out soon. I want to know what happens to Emily next and see where this story goes next. Plus, I’m still hopeful that Emily might travel to Garret (the Lizardman’s) homeland. They need to find help to win the war somewhere! I don’t have any easy time finding fantasy books I like. I’ve read many bestseller fantasy authors and I haven’t cared for any of them. I find it’s best to read indie author fantasy, but I was still looking for something epic, a long journey into another world. Haven Lost is perfection in every way, ranging from its excellent pacing to its thorough explorations of not just a world but cities that are opposites. I didn’t find anything a far stretch because de Lioncourt is always careful to explain why or how something makes sense, and yet he crafts it so that it feels like part of the story, not like an author trying to explain something to his readers. I liked the main character, Emily, who is very strong but has her weaknesses. She’s not impossibly perfect and she’s no cookie-cutter character. Her allies – and enemies – are the same. By the time the book ended, I felt as if I had been on an adventure with the characters. It was as if I had endured everything right alongside them, and when I looked back at all we’d come through, I didn’t know how de Lioncourt did it so beautifully. I never once felt the story drag. There was constant movement of the plot and advancement of our understanding of the world. De Lioncourt’s pacing moves the story at a pace that feels realistic, not so fast that I wanted more time in any scene, and not so slow that I wanted the book to move forward. It was simply…perfect! The voice talent, Reay Kaplan, was excellent. She spoke very clearly, performed the accents accurately, and maintained a sense of excitement where it was appropriate. She even sounded teary in a couple of places that called for it. I would say I’d rather listen to the audiobook a second time than read the book in paperback, simply because I felt Kaplan enhanced the reading experience. Emily is a high school hockey star in Minneapolis, with an extremely dysfunctional family life. For the most she is a typical teenager, except for her strange ability to know when and where another player on the ice is going to move. One day it all changes when she starts seeing the reflection of a boy in mirrors and windows, and when she gets home finds her mother dead of a drug overdose. She runs away and when she awakes she is in another land, another time, another world? Haven Lost is the tale of Emily's discover of what is important to her and her life in this strange place. She makes friends, decides without any prior knowledge of people who is good and who is evil and sets out on a quest she doesn't understand. Along the way she picks up a best friend in Celine, a ward in Michael and someone who just might become more than a friend in the future, Corbbmacc. Together they travel the land, looking for the answers that they need to understand what is going on. 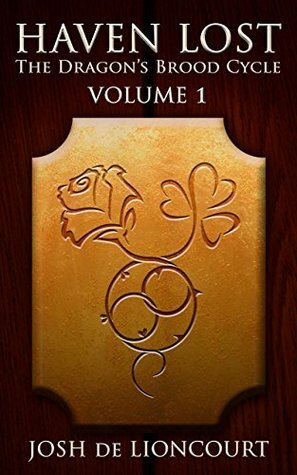 Josh de Lioncourt has done a wonderful job of mixing history, fantasy, and magic together into a tale that is compelling and exciting. Some of the world building was really neat, with two-headed crows and people who are as much dragonfly as human. While there is a resistance against the evil being (who wields flowers and plants of all things), it is disjointed and partially at war within itself. Magic has serious repercussions, and their long-needed savior might be just as clueless as they themselves are. Being an ARC copy, there are a number of editorial mistakes still present (misspellings, homonyms, capitalization, etc), but most were understandable, and will hopefully be fixed in the final book. At just over 500 pages, it is a nice long length, though there is obviously going to be a sequel. 16-year-old Emily Haven, a star on her high school hockey team, is suddenly ripped from a modern world of cell phones, pop culture and gingerbread lattes to a world where technology seems mystical and alien, but where magic and myth are very much alive. She finds herself immediate embroiled in a war between two opposing forces, both of which want to use her for their own ends. Determined to go her own way, Emily adapts quickly to her new life and gains skills, confidence, and leadership abilities 16-year-old Emily Haven, a star on her high school hockey team, is suddenly ripped from a modern world of cell phones, pop culture and gingerbread lattes to a world where technology seems mystical and alien, but where magic and myth are very much alive. She finds herself immediate embroiled in a war between two opposing forces, both of which want to use her for their own ends. Determined to go her own way, Emily adapts quickly to her new life and gains skills, confidence, and leadership abilities she never knew she possessed. This story isn't just about magic and battles, it's about personal growth, the value of friendship, and Emily's courage to follow her own heart. This is a great YA book. The story is fast paced, almost every sentence reveals something new about the world, the characters or story line. This is a breath of fresh air in a genre filled with huge books full of fluff. My only complaint is that sometimes things move too fast. Too oftern the characters jump recklessly into the breach with no plan and no preparation and don't pay the price. Just a great, riveting, absorbing start to a what I hope will be a long-lived series. The characters are familiar without being cookie-cutter stereotypes. Mr. Lioncourt has obviously walked the land of his story and memorized every rift and roll of the landscape. I'm truly looking forward to the next installment. What a great read ! Even though I am a voracious reader, I don't read a lot of Fantasy. So when I do it better be good...and different. This story accomplishes both with vivid characters and worlds. The story and plot line are flawless and the ending will have you begging for the next volume. This book had me hooked from the first few pages. A wonderful story with amazing characters that you grow to love with each turning of the page. Filled with excitement, emotion and humor throughout I just can't wait for Volume 2!